Preheat oven to 325°F. Spray 15x10x1-inch baking pan with cooking spray. Combine yogurt, Fleischmann's, sugar, orange peel, almond extract and cinnamon in large bowl. 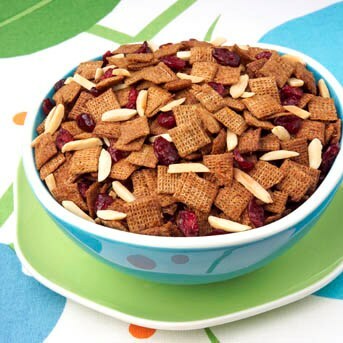 Add cereal and almonds, toss to coat. Spread evenly in prepared pan. Bake 20 minutes, stirring after 10 minutes. Remove from oven; stir in cranberries. Let cool completely; store in tightly covered container at room temperature for up to 1 week.